As a small business owner, having your own custom sales receipts designed can be expensive. Also, there is usually a minimum order to meet. If you happen to change your mind on the design or need to edit information on it, then you usually have to stick with annotating or crossing out whatever details need updating. Having to place a new order simply because you want to change some information on it would be costly. The best solution for this is to have your own printable sales receipt template. With this template you can fully customize it to your business needs, and make copies when you want to or save the file to your computer. 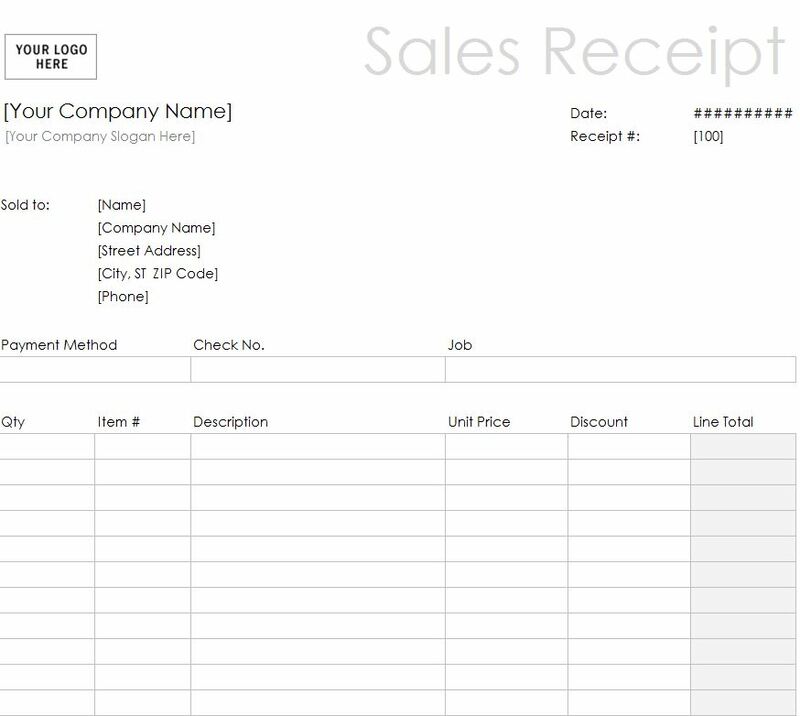 The printable sales receipt template available on this page is free to download and compatible with Microsoft Excel 2003 or later. Download the free printable sales receipt template and save the file to your computer. Once the file has downloaded – find the file and open it to start editing. There are several fields you can edit with your own business details. You can also insert a logo if you have one or delete the box. Other areas that can be customized include business name and slogan, name, address and phone number of the person the product or service was sold to. You can also edit the date, receipt number, and at the bottom of the form the editable fields include your business address, phone and email. Since the printable sales receipt template is easy to customize with any information you want, you can include an extra text field offering something special to the customer or client on their next order. Depending on the type of business it is, this can be a discount on a specific product or service plan. You can change the font style and font color to your liking including making them bold or italic. The receipts can be saved and a copy can be sent by mail to your client or customer. Many people like to minimize paper piles – this allows them to have the receipt and print it out when needed. Using the free printable sales receipt template is a good way to save money and an excellent alternative to ordering custom designs that you might need to make changes to later. By having your own easy-to-customize template saved to your computer, you can create different custom receipts that fit your needs anytime you want.